Make the coming Halloween a fantastic experience with Spirit Halloween! This online store specializes in Halloween costumes for children, infants, and adults, and includes everything from pirates and cowboys to gangsters and mermaids. Wigs, makeup, masks, hats, and a wide variety of other accessories are available to complete practically any costume you can come up with. And on top of providing Halloween costumes, this online store exhibits an extensive collection of decorations, lights, fog machines, and props of tombstones and spooky creatures. Need help deciding on a costume for Halloween? Spirit Halloween's got you covered! Browsing through the website's vast selection of costumes will give you plenty of unique and clever options. Upon searching within costumes for women, men, boys, girls, or infants, you can find a large number of categories to narrow your search, such as theatrical, historical, zombie, superhero, occupational, pirate, storybook, and clown-themed costumes. Whether you want a costume that is scary, funny, or based on a popular TV or movie character, there are plenty of possibilities to consider. And with Spirit Halloween's affordable prices and wide range of available outfit sizes, it is easy to find costumes for the whole family. If desired, customers can also browse through selected costumes that work well for couples and groups. Besides hundreds of outfits, there is a great assortment of matching wigs, masks, and hats to complete your costume. For further embellishment, you can find plenty of accessories, such as wings, brooms, weapons, fangs, horns, ears, tails, wands, tiaras, shoes, and gloves. To complete the look of your character, you can also purchase the proper makeup needed, including face paints, temporary tattoos, colored hairspray, and additions for your nails, eyelashes, and teeth. When it comes time to decorate for the Halloween season, Spirit Halloween has everything you need to transform your home into a haunted mansion! Life-size zombie props, animatronic skeletons, fog machines, black lights, inflatable monsters, tombstones, fake body parts, and festive party supplies can turn October into the most enjoyable month of the year. There are many spooky materials to decorate both inside and outside your home and products are available to target your windows, doors, car, and garage with witches, bats, spiderwebs, and other haunted elements. The company is dedicated to its clients and enjoys a good reputation for excellent customer service. Products are available all year-round. Despite its name, costumes can be bought for occasions other than Halloween and can work well for plays, school events, and for occasions centered around other holidays such as Christmas, St. Patrick's Day, and Thanksgiving. 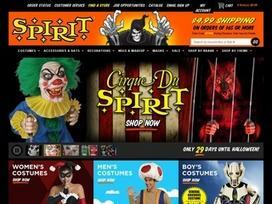 Visit the Spirit Halloween website to find the best costumes and decorations to suit your needs. Share what you think about Spirit Halloween, and your favorite ways to save there! It's never too early to shop for Halloween! Every year I look for inexpensive Halloween costumes and this website has by far the best variety and prices.